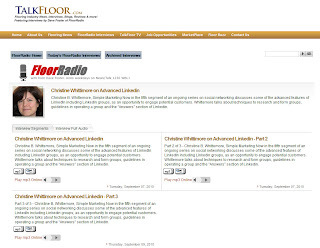 The social media marketing series on TalkFloor continues with Advanced LinkedIn! Here is a link to the three interviews in this Advanced LinkedIn segment. In the last session, we did an introduction and overview of LinkedIn. LinkedIn is a powerful social networking platform as we discussed in the last session. 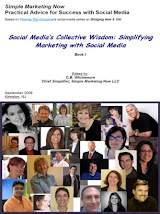 It's considered the #1 resource for marketing your business. In Advanced LinkedIn, we cover some of the advanced features – Groups, Answers, Event, Search. Dave and I are both on LinkedIn, so please do connect with us. As a reminder, you should definitely set up a profile on LinkedIn – it’s free. Complete it 100% paying attention to using relevant keywords and include a photo. Claim your personalized URL; link your website and blog to your profile. Connect your Twitter account if you have one. Then, update your status regularly – I use Outlook to remind myself. Connect with people you meet and share relevant links and resources. Within your individual LinkedIn profile, you can join up to 50 groups. Groups are a great opportunity to reach and engage with potential customers online. The first step is to search existing groups based on keywords your consider relevant to determine if one already exists. If yes, join it. Familiarize yourself with the group’s guidelines; read through existing conversation threads; do some research on those who actively participate and start getting involved. Definitely consider researching successful groups so you understand what makes them work, what kinds of questions does the moderator ask? How frequently do new discussions start? What are the group’s dynamics? Just a few people or a wide range of perspectives? What is the tone of the discussion? If a group doesn’t exist, create one! For a group to be successful, it’s important to actively manage it and encourage discussion. If you don’t it will become overrun with spammy self-promotion rather than valuable insights. It’s a good idea to develop and post guidelines for group interaction [be respectful, no self-promotion, what topics are acceptable, etc.]. Post those as a featured discussion so everyone can find them. When you welcome new members, send them a link to the guidelines. By the way, you can send announcements to the members of the group; you can import your blog feed into the News section. You can also directly message group members even if you aren’t connected to them. LinkedIn has added a lot of rich functionality to groups. Please note: as with all social media and social networking tools, this will take focused time and effort to generate success. You are building a community. It’s a good idea to spend time beforehand determining what your objective is and how you will add value. You can then prepare a content plan and develop a content calendar. For example, let’s take the TalkFloor group which has ~ 518 members. You'll notice a wide range of flooring related conversations: from green cleaning, to window treatments in flooring stores, to some self-promotion. You have prominent industry people engaged [e.g., Warren Tyler], but it isn’t actively managed. Then, consider one new industry topic per month. Let’s say for September it’s ‘Cash for Caulkers”; develop 4 subthemes for each week of September related to Cash for Caulkers. 1. Recap legislation. How does this affect you? 2. Implications for consumers? How can you benefit? 3. Environmental repercussions. How can you benefit? 4. How does it relate to the flooring industry reports on the state of the flooring industry? Perhaps each theme/subtheme relates to TalkFloor interviews that Dave has done. Dave might invite industry experts to help ask and answer questions with each sub-theme. Possibly CRI Government Affairs can give a big picture overview of Cash for Caulkers from a legislative perspective? Dave might invite Stuart Hirschhorn to answer data questions about the flooring industry. By the way, you can make your group private and use it as an ongoing focus group discussion. You can also ‘follow’ individuals within a group [as you can companies now]. These are particularly effective for lead generation, demonstrating expertise. Access Answers from the “MORE” tab. When you respond to relevant questions, your answers will appear in your network updates. You can include links to relevant articles, blogposts, etc. [e.g., you can add value]. Do your homework so you know who’s asking the question. You can also ask your own questions for research; you can make your questions private. You can use LinkedIn Events to promote your activities and invite your connections. When they RSVP, it shows up in their home profile so all their connections see it. To access, go to MORE and follow the steps/answer questions to Add an Event. Search is powerful in LinkedIn. You can search people and companies [as well as groups, jobs, answers…]. LinkedIn now offers Direct Ads. Access them through MORE. Allows you to target specific parameters with ads. Go explore groups; pick one to get involved in. [Maybe TalkFloor?] Get involved in the conversation. Explore Answers and pick one to answer.